While we want products to live up to their names, there are times when we wish they didn’t. One such instance is when you have super glue on your skin. As minuscule as this problem sounds, you know how frustrating it can be if your fingers are stuck together. If you try to pull them apart with force, you may end up ripping your skin too. Ouch! However, rest assured, it is not the end of the world. Though super glue is meant to form an unbreakable bond with the surface it adheres to, there are ways you can break this bond safely. You don’t even need to buy any specialized products to remove super glue from skin. Some household staples will help soften the glue and enable you to pry it off your skin. Below are four easy and efficient ways to remove glue from skin. If you’re having a rough day, you might also need to check out our hacks for cleaning super glue off your eyeglasses. Super glue’s key weakness is acetone. 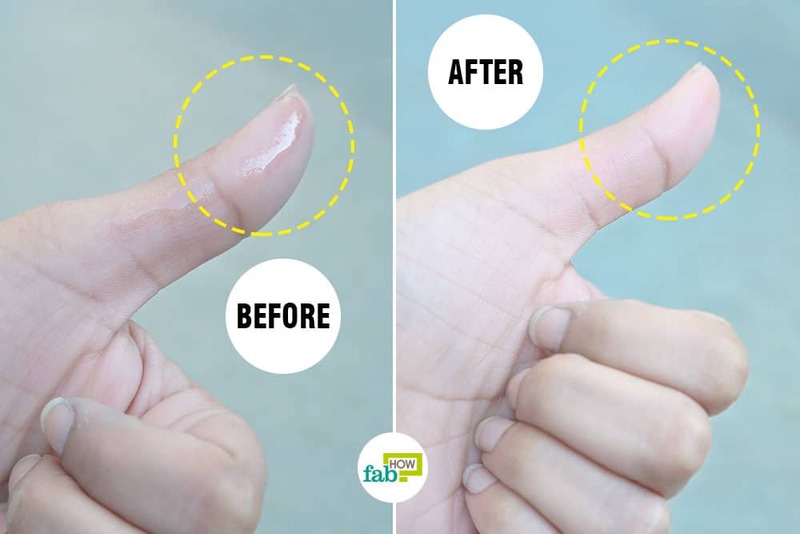 Applying acetone directly on the affected area can quickly dissolve the bond between the super glue and your skin. It will then be easy to pry the dry glue off. 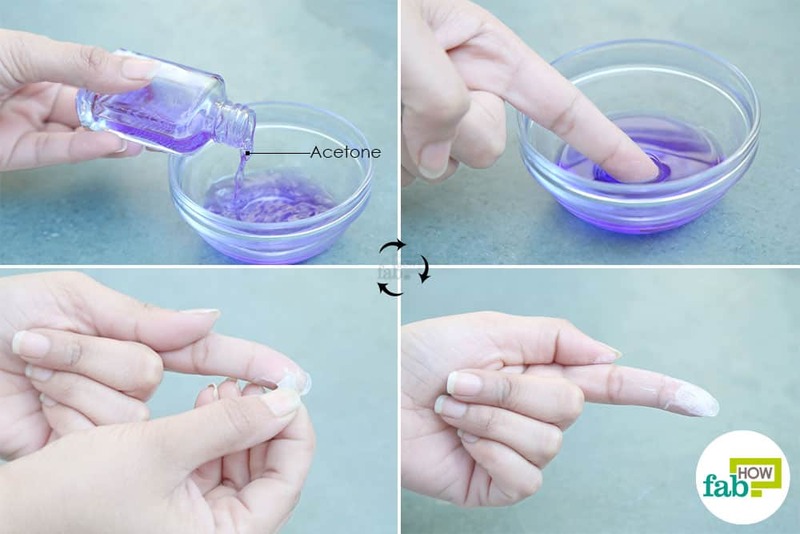 While you can buy pure acetone online, you can also use an acetone-based nail polish remover to remove super glue from skin. Note: Acetone can dry out your skin. It’s essential to apply a moisturizer once you’ve gotten rid of the glue. Pour acetone-based nail polish remover into a small bowl. Soak the affected skin in the remover for 5 minutes. Try to rub off the glue with your fingers. If it doesn’t come off, soak it in the acetone for a couple more minutes. Once the glue is loose enough peel it off your skin. Wash your skin thoroughly with soap and warm water. Apply a thick moisturizer to prevent dry skin. 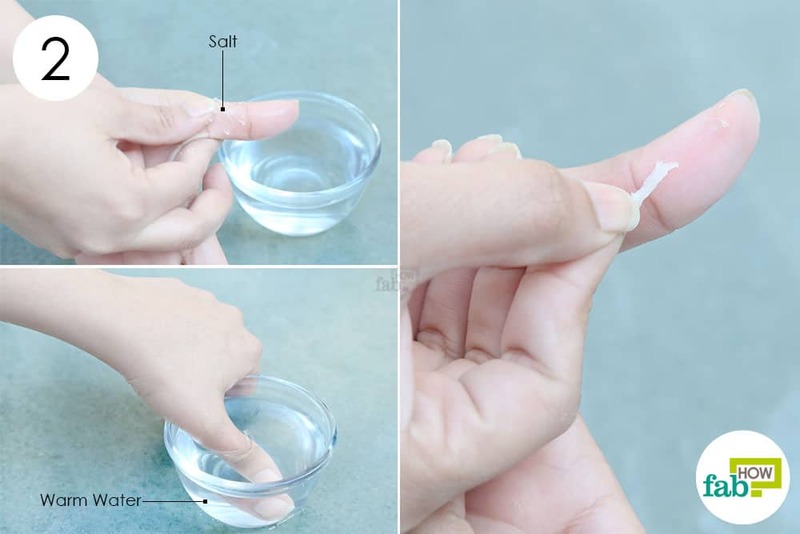 If you are wary of using acetone on your skin, try to remove super glue from skin using table salt. The granules of table salt work as an exfoliant to slough the dried glue off your skin. However, you first need to soak the affected area in warm water to soften the glue. 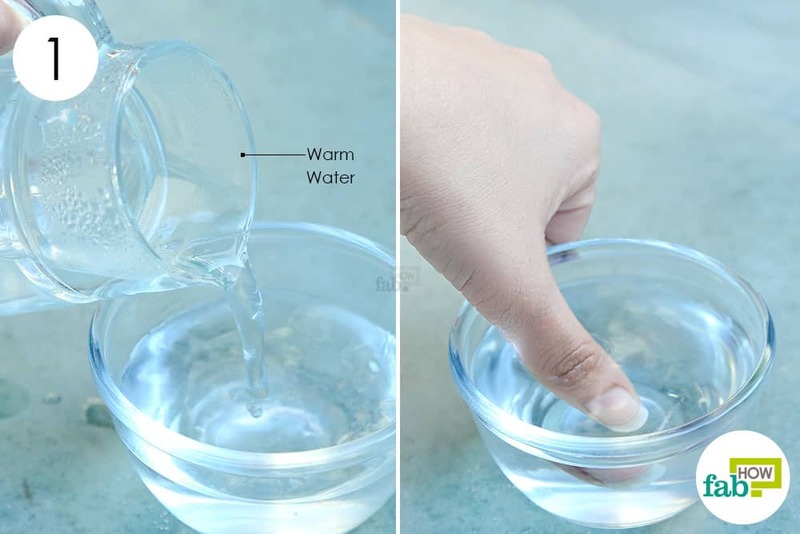 Soak the glued skin in the warm water for 10 minutes. If the glue is on a body part that you cannot soak in a bowl, just dip a spare cloth in warm water and press it against the skin like a warm compress. Scrub the stuck super glue with table salt. You may need to apply some force to work the salt into the skin. Continue scrubbing for at least 1 minute. When the glue starts peeling from its edges soak the area again in warm water for 1 to 2 minutes. The glue should now quickly come off. Rinse the area thoroughly and apply a moisturizer. If some glue remains on your skin, repeat the whole process. However, this time replace the warm water with lemon juice. The acid in the juice will help dissolve the remaining glue. If you have sensitive skin, start by trying out this gentle remedy to remove super glue from skin. Dawn dish soap is a powerful dishwashing liquid that you can use for multiple cleaning purposes. However, its formulation is mild enough to be used on your skin. It works efficiently in breaking the bond of the super glue, which can then just be peeled off. You will need to be patient as it may require several soaks to get the job done. 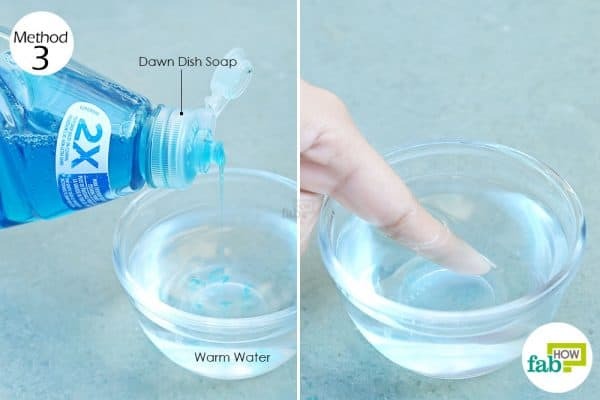 Mix 5 or 6 drops of Dawn dish soap into 1 cup of water. Soak the affected skin in the solution for 5 minutes. Try to nudge the edges of the glue with your fingers. If it doesn’t peel off readily after the soak, continue soaking and rubbing the glue until it comes off entirely. Rinse your skin thoroughly and apply a good moisturizer. Rubbing alcohol is an active cleaning agent that can also be used to remove super glue from skin. It will work as a solvent to dissolve the dried glue. 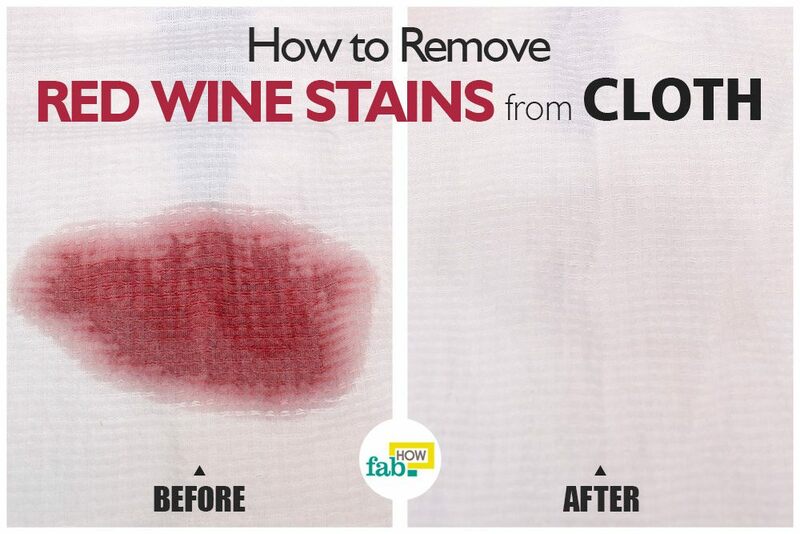 Wash the area with warm water. You can also use a warm soap solution to soften the glue first. 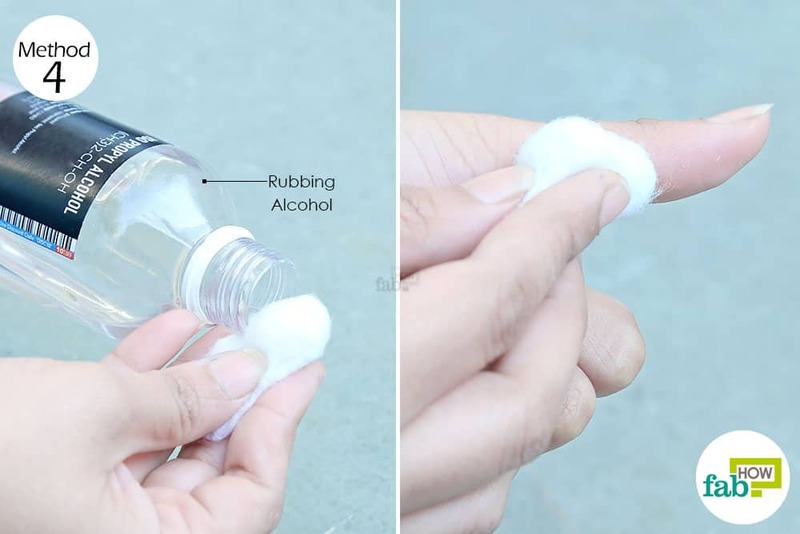 Soak a cotton ball with rubbing alcohol and press it against the dried glue for 1 minute. Rub the cotton ball over the glue until it starts coming off. If needed, soak the cotton ball in more alcohol. Once the glue has entirely come off, rinse your skin with water and apply a thick moisturizer. Prevention is better than the cure. Wear rubber gloves while working with super glue to avoid accidents. Keep super glue away from cotton clothes. The chemical in super glue causes an exothermic reaction that can lead to a skin burn. You can also try removing super glue from the skin with a mix of olive oil and salt. Add enough olive oil to salt to make a thick paste. The oil will help lubricate the area and make it easier to peel off the glue. You can also check out hacks to remove super glue from plastic surfaces.